When Adam asked me what I was reading the other day, I responded, “It's called The Intuitionist. It's about race. And elevators.” He made a noise expressing both surprise and confusion, but pretty much left it alone. Like any good husband would, he reads my site. He knows he'll get better information out of me if he waits for the written version of my bookish thoughts. So here it is: Lila Mae Watson is an elevator inspector in a New York-ish city full of high rises. The time period is as murky as the setting; the elevator technology is highly developed, but the inspectors have typewriters on their desks. I've seen the book described as noir, and that's exactly what it is—picture everything in grayscale, and men in dark hats puffing on cigars. Lila Mae has worked hard to get where she is: she's the first-ever woman of color to be hired as an inspector. Unsurprisingly, her coworkers, overwhelmingly white and male, don't exactly roll out the red carpet when she joins their ranks, especially because she is of the new and controversial Intuitionist school of elevator inspecting. She is an outlier in just about every way possible, but she keeps her head down and throws all her energy and effort into the job. And she's good at it—until one day, an elevator in a flagship municipal building goes into freefall just after Lila Mae has deemed it safe for use. Suddenly she is at the center of a political whirlwind, with everyone from journalists to mob bosses circling her and sniffing for blood. Everyone has an agenda, some of them well-hidden, and it soon becomes clear that the only person Lila Mae can trust is herself. 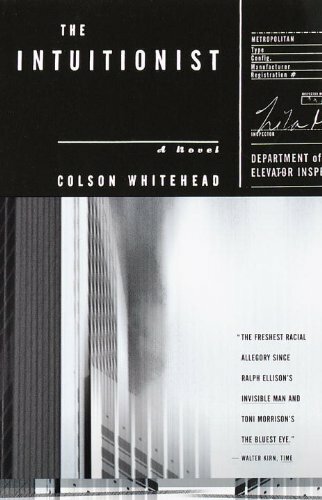 I finished The Intuitionist this morning, and while I realize saying it's “about race” is as helpful a descriptor as if I termed rain “fairly dampish,” its complex themes are still churning around in my mind. It hasn't coalesced for me yet. This feels like the kind of book you could read in a literature class and discuss for about a million years. As for the elevator part, it seemed an odd choice to me at first, particularly as I struggled through passages of technical information about how elevators operate and the many ways they can fail, but by the end I could see how fitting it is, what with the upward/downward mobility connotations and the political dichotomy between the Intuitionists and Empiricists. Fortunately, I've already graduated college, so I don't have to write a thoughtful essay analyzing all the moving parts of this book. I'll just let my thoughts continue to bubble around in my head and encourage you to read this book yourself so that you can have bubbles too.